Just Jingle: Wrap It Up! Hello, folks! It is TIME for a BRAND NEW CHALLENGE on the Simon Says Stamp Wednesday Challenge blog! This week we want to see you WRAP IT UP! We want to see you use ribbon, twine, and/or string on your projects this week. The Design Team is featuring May Arts products. You don't have to use them to play along, but we'd love to see them on your projects if you have some around! I decided to do something other than a card this week, which is pretty odd for me, but you know how it goes... sometimes you just go WILD AND CRAZY folks! Wild. And Crazy. These wood tags, THOUGH!!! For reals. I absolutely love these things. They are from the Amy Tangerine Finders Keepers collection and you can't buy any because I want them all. Wait... not, that's not what I'm supposed to say... well... fine. I'll share, then. You can find them here. Hmph. 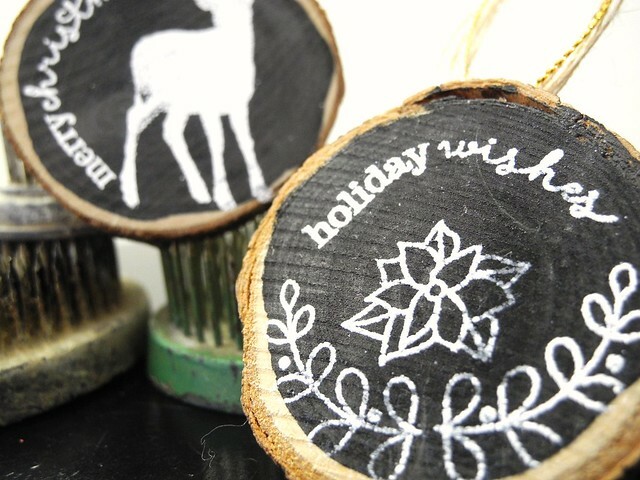 I colored them with a chalkboard marker, but you could also use Chalkboard Paint to create the black chalkboard surface. I then stamped and embossed them with the Winnie & Walter Happy Christmas stamp set images. This stamp set was a perfect one for these fun tags! Finally, I stapled May Arts gold string and burlap string to the back of the wood slice with my Tim Holtz Tiny Attacher to finish off my tags. I seriously want to make lots of these. LOTS, I tell you! Now it's YOUR turn! Create something fabulous inspired by the WRAP IT UP! Challenge theme and link it up over on the Simon Says Stamp Wednesday Challenge blog for your chance to win a $50 Gift Voucher to the Simon Says Stamp Store! WOOT! WOOT! All of the links found in this post are affiliate links and supplies are noted and linked throughout the text. Thank you so much for your support! Oh, these are awesome!! Love! What a fun idea to use wood tags, Jennifer! Love your idea! These are super cute Jennifer!! 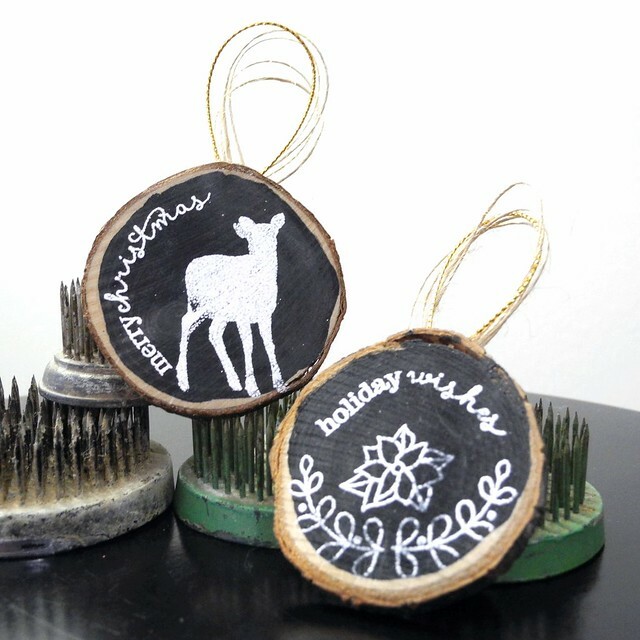 Gorgeous hanging tags Jennifer, I love the blackboard look with fabulous stamped images!! These tags are so fun! Love the chalkboard look! These are so FUN!!! LOVE!!! Fabulous tags Jennifer! I LOVE the shabby, earthy look of these, natural and AWESOME! I can image a whole Christmas tree with just these as ornaments! I've never stamped on wood-must give it a try! Adorable ornaments, Jen! Love it. I just love these, seriously, love them! What a great idea to use chalkboard paint and heat emboss the white image.